Sounds like the driver transistor for the flipper relay is shorted, but I can't tell from the online schematics what number it is. no they should cut out as soon as the game is done. You have a shorted on transistor for the flipper relay. Could it be the relay at k1? Ths flippers were not working at all then I changed tip36c at q5 and the flippers are active at all times. I have tested and everything seems to test fine but I dont know how to test the relay or if it even controls the flippers..
Nobody had this problem before? At this point I'm thinking it could be on the CPU board.. Any help much appreciated!! Find what Tip 102 controls the relay. Ground one one end of an alligator clip to the frame or screw of the board, and touch the metal tab of the correct 102. the relay should click and move when you ground it out. look in the manual to see which one it is. All tip102 test good what's the c46 c47 in the pic I attached? They give no reading at all.. Most Likely not. Why aren't you doing what CaptNeo has asked you to do? Because the board was out of the game, I will put the board back in the game and try that.. So I just clip one end to ground and then touch each tip 102 and that will tell me the bad one? I tested them with the board out of the game and everyone tested good from what I could tell. No prob.. Any help is appreciated as I'm a dummy when it comes to this stuff!! I'm all out of ideas and any help would be greatly appreciated!!! Also not sure if this makes a difference but the pia led is not on.. The blank, +5v are both lit but pia is not.. I had this issue with a Jurassic Park.... K1 was pitted. First thing you can do is reflow the points underneath K1. K1 does sound like the suspect. It didn't click at all when you grounded out it's Tip 102? Should hear it click over every time you touch it's tab. 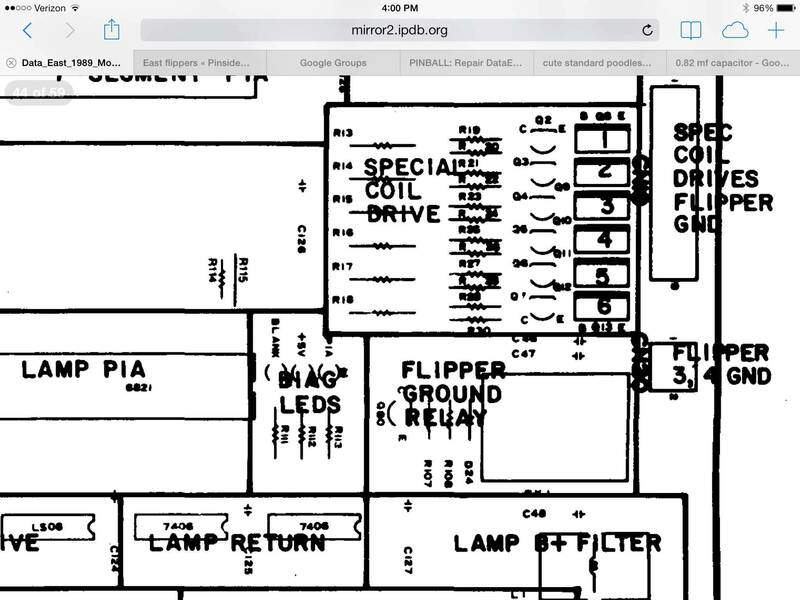 Should I be able to tell from the schematics above what tip 102 it is that controls flipper relay? Also we are talking the relay on the CPU right? it shows what TIP 102 it is in that part of the drawing you showed a picture of. it's Q something, but I cant' read it because it's all smudgy. Right after the 7402 chip, that transistor after that, that's the one that controls K1. Yes, if you have the manual. 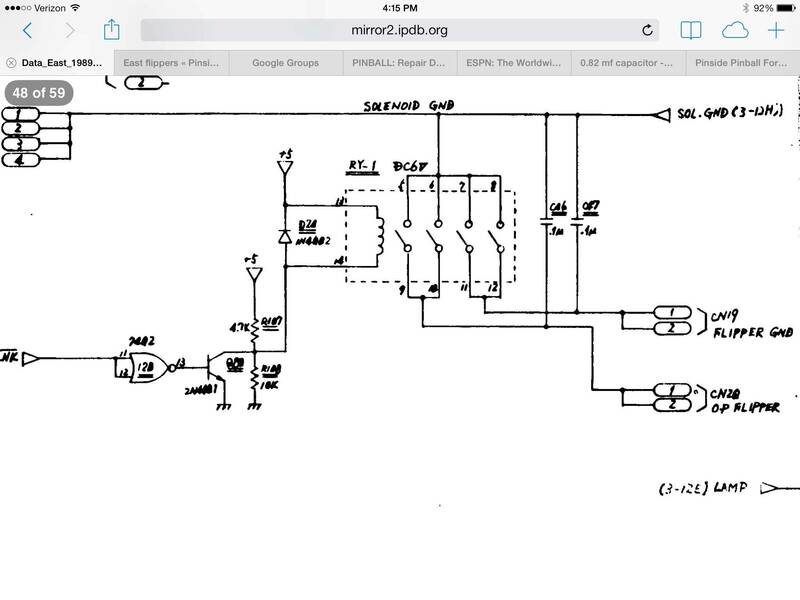 The schematics on ipdb are garbled, couldn't make out the transistor number. And yes, it would be the one in the Flipper Ground Relay section in your diagram. You're not hearing the relay because it is stuck always on - grounding the transistor is not going to do anything. Can you put a magnet on the relay and get it to click off? It's that little transistor to the left of the flipper relay. Blurry in the schematic but it looks like it says Q80? Reflowed points below k1 still the same... what about the relay on the cpu? Also replaced the 2n4401 at q80.. with my limited abilities everything I test looks good but c46 c47 they are to the right of the relay on the cpu in the above schematic..could that be the problem? I don't think it's the caps. They'd both have to be shorted to cause the problem. If the transistor is good, maybe the NOR gate output (7402 pin 13) is stuck HI, or the input from the PIA is stuck LO. Do you have a logic probe you can check those with? No logic probe.. if radio shack has them I will pick one up tonight... also could the relay be bad? Its unusual, but relays can go bad. I usually reflow the solder on these (which you already did) and that typically takes care of them. On the Jurassic Park I had, I had to pop open the relay (remove the plastic cover), and file clean all the burning/pitting that was inside the relay. Yes, the relay could also be bad. Easy to test out of game. Use a DMM to measure the relay switches for no continuity, then apply +5VDC power to the relays coil. Now when measuring the relay switches they should have continuity with power applied. It's probably one of the two - either the circuit is "telling" the relay to turn on all the time (most likely the transistor is shorted) Or the relay is frozen in the on position mechanically. If the relay is good you can use a DMM to find out why it is turning on, you don't have to run out and get a logic probe to do this.